Briarbustertm Hunting Pants And Chaps: The briarbuster company is dedicated to providing hunters excellent quality, fairly priced clothing that will provide years of service. Our customers will always be treated with courtesy and respect. Our products are fully guaranteed and we stand behind them faithfully. Hunter's Shooting Association: Advanced Field Marksmanship for Hunters. North Berwick Rod & Gun Club: If you are looking for a safe friendly place to shoot rifle, shotgun, pistol or bow or are looking for a group of people that just love to talk about hunting, fishing and shooting.... Come give us a look. Wildwind Farm & Kennel: We specialize in training flushing dogs for upland and waterfowl game. 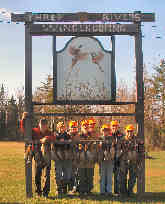 We can customize a training program for you based upon your hunting preferences and needs. We have mixed cover available on private and state property to give your dog its best chance at success.